The company LDV is dating back from 1915, when the present factory headquarters in Birmingham was owned by a known arms concern Vickers. During World War II it was the largest British arms and ammunition manufacturer. 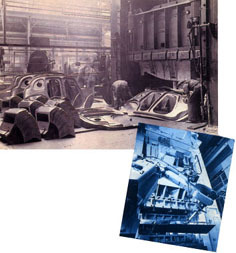 Cars manufacturing has started at the end of World War I when the production moved from the Wolseley and the factory switched to civilian cars production. In 1926, the company than called Wolseley Motors was sold, and the owner was Willian Morris. Between the wars there were then very successful MORRIS cars produced. In the Second World War, the factory went back into weapons production / as well as eg. Rolls - Royce and Jaguar / produced Crusader tanks, cannons, parts of the Lancaster bombers and Supermarine Spitfire fighter planes. 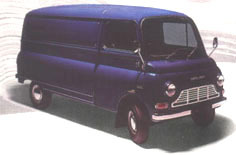 After the world war II began in Birmingham production of light commercial vehicles MORRIS J, JU, J2, J4 and later Sherpa, and continued when the factory became part of the ROVER group, later British Leyland. In subsequent reorganization, the group split into separate factories - LEYLAND , and their vans production was sold by the Dutch group DAF distribution, later under this mark was also sold as LDV 400 (Leyland-DAF Vans). By that time, LDV was a fully independent British car manufacturer with more than 1,400 employees and producing 350 cars a week in different versions for UK and global markets. In 1994, the automaker increased its capital by 23% and market share has increased by 16%.This meant increase in capital to invest in upgrading production lines, new technologies, and over 90% of the profits of the last two years the company focused on developing a new range of utility vehicles. 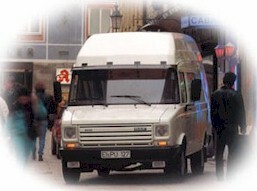 The program of LDV vehicles to the already mentioned range of Leyland-DAF400 (here known as the DAF 400) was launched in 1995, in 1996 when production of the Convoy began, with complete exterior and interior redesign, the vehicle was developed at cost of 30 million British pounds in collaboration with leading British firm Ricardo, which "silenced" the it under the tightened border EURO 2, followed by models of EURO3, and EURO4. Production of all vehicles types has ended in 2006, when the complete factory was sold and closed.